By Skot Butler, President, Intelsat General Corp. The space industry is going through an exciting period of innovation and growth. New technology, such as high-throughput satellites (HTS), have transformed space architecture and fundamentally changed what had been a fairly static sector. Technology in space is belatedly catching up to the profound advancements in terrestrial IT networks, something many have called the fourth Industrial Revolution. In 2017, Intelsat and our partners led by example. The company continued to build out our fleet of HTS satellites. In the summer, the Intelsat EpicNG satellite Intelsat 35e was launched, powering Ku-band services for mobility and government applications in the Caribbean, trans-Europe to Africa, and on the African continent. 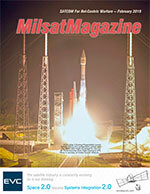 This past fall, the company launched Intelsat 37e, the fifth and largest Intelsat EpicNG satellite to be placed into orbit, featuring the globe’s first all-digital HTS platform. In June, Intelsat partner Kymeta began shipping its flat-panel antennas, which use electronic beam-steering instead of mechanical parts to follow a satellite across the sky. Kymeta’s design makes satellite communications a viable option for new airborne, maritime, and ground-mobile use cases. Artistic rendition of the Intelsat-37e satellite. Image is courtesy of Intelsat. Partnerships with other antenna developers will facilitate the availability of flat, light-weight antennas that will be well-suited for in-flight communications from aircraft carrying government officials, as well as a smaller class of unmanned aircraft systems that could be used for non-military operations anywhere in the world. Projecting forward into 2018, the Horizons 3e satellite is expected to launch in the second half of 2018, and will provide Intelsat EpicNG service to the Asia Pacific region completing our global HTS platform. Customers will purchase “SATCOM as a Service,” as opposed to simple bandwidth. Here again this brings space up to date with the overall trend towards “Everything-as-a-Service” in the broader IT market. This new model will, hopefully, be supported by potential change evolving on the SATCOM procurement front. In May, all expert feedback and technical reporting is expected for the anticipated DoD wideband SATCOM Analysis of Alternatives (AoA) report. Once this data is collected, the report itself can be assembled. In December, there could also be the beginning of DoD’s implementation of Section 1601 of the National Defense Authorization Act. Among other things, this language assigns acquisition authority for COMSATCOM leases to the Commander of Air Force Space Command in consultation with the DoD CIO as of December 12, 2018. Before the close of 2018, the company expects to launch the first Mission Extension Vehicle (MEV). This spacecraft uses a docking system that attaches to existing features on a satellite, providing life-extending services by taking over the orbit maintenance and attitude control functions of the satellite. At the end of service life the MEV can then guide the satellite to a safe graveyard orbit, preventing any potential orbit congestion or debris issues. Extending the lifetime of on orbit assets enhances operational flexibility and allows us to be more agile and responsive to customer requirements. 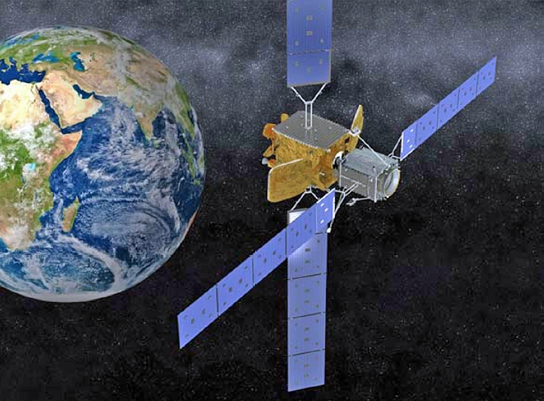 An artistic rendition of an Orbital ATK Mission Extension Vehicle (MEV) refueling an on orbit satellite. 2018 also puts the launch of Intelsat partner OneWeb’s LEO satellite constellation just a year away. We look forward to collaborating with OneWeb to develop integrated GEO/LEO services that will enable government customers to have critical fixed and mobile communications anywhere around the globe. 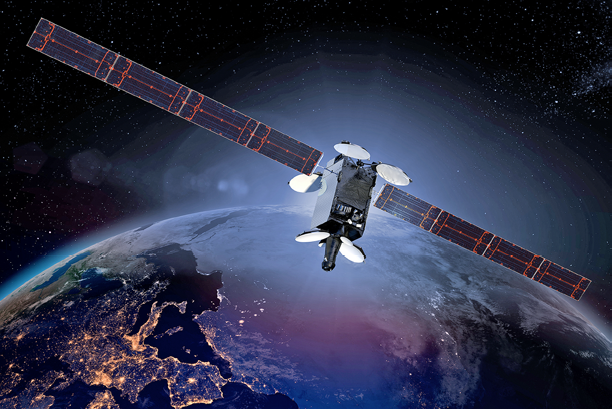 Adding OneWeb’s low-latency LEO broadband capacity to Intelsat’s global fleet of GEO satellites will offer government customers an unprecedented level of coverage. Intelsat General is working hard to make 2018 a big year in space. We’re pushing forward on all fronts — new spacecraft, new terminal technology and new business models. At Intelsat General, we understand the innovative power that reliable, secure and cost-effective satellite connectivity delivers. Better technology in space better supports the mission, and better defends our country. to the company’s government customers.